Caves, bugs, groundwater, acoustics, bats & more! I’m interested in the distribution, taxonomy, and conservation of groundwater amphipods in western North America. Major modern drainage divides may provide an opportunity to examine ancient relationships among western species of Stygobromus (Amphipod: Crangonyctidae). What better place to start investigating this than Colorado? At present, I’m working with Colorado College students on studies of some of the habitats in which Stygobromus amphipods occur, building on earlier studies of this amphipod genus in the western USA. As fresh material is obtained, I’ll begin working with other researchers, to tease apart genetic relationships. This project is underway – contact me if you are interested! 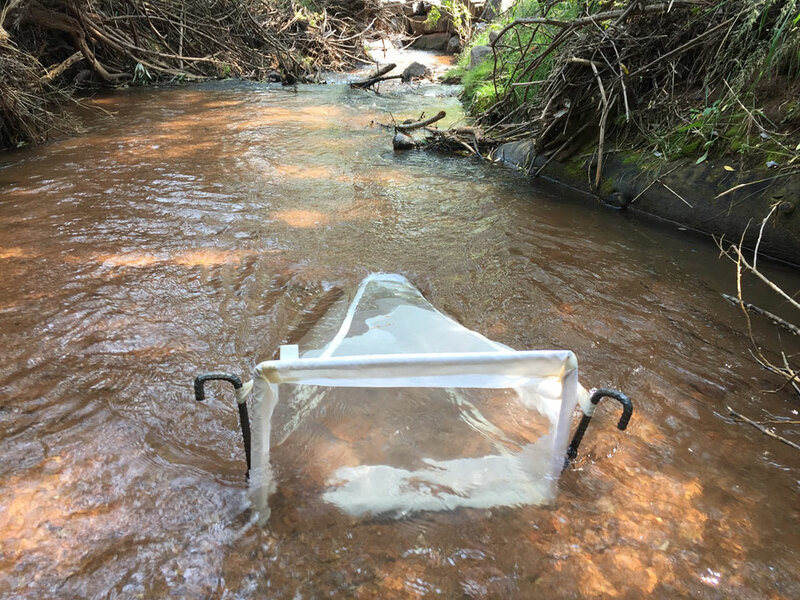 This work is presently supported through a grant from the Cave Conservancy Foundation, whose funds are supporting a two-year (2018-2019) statewide survey of groundwater amphipods in Colorado. The project includes funding for a student to conduct summer research – so, look through the information below, and contact me if you are interested! Colorado College students also have opportunities to be in involved in this research for just a single block (instead of the summer), with some advance planning and discussion with me and with your department. 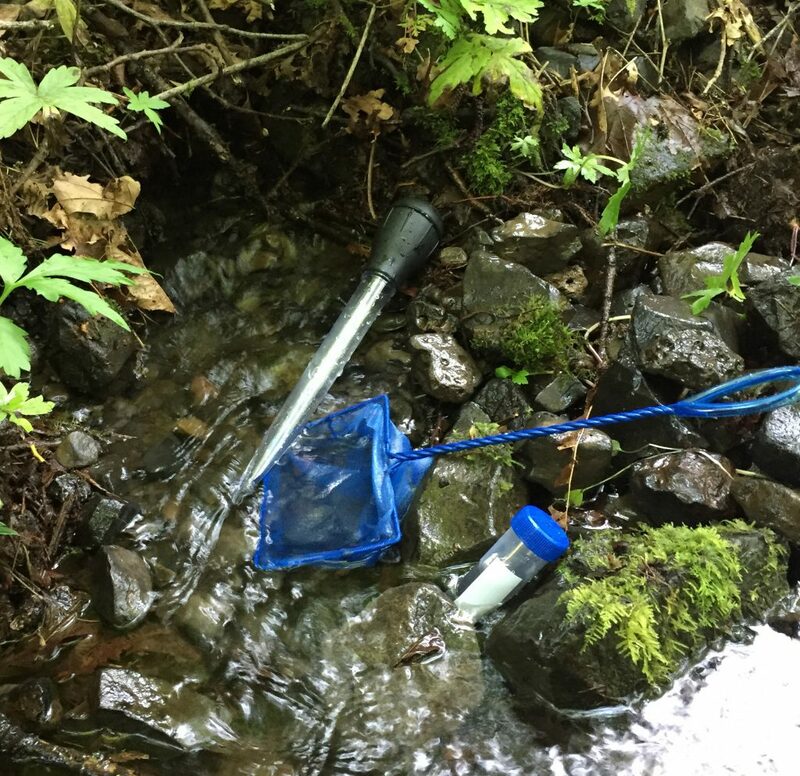 Keeping out of the coldest part of winter, and avoiding snowmelt (when streams are too high to safely sample), means that Block 8, Summer, and Blocks 1-3 are the best for sampling. Drier winters or warmer conditions could expand the sampling window. 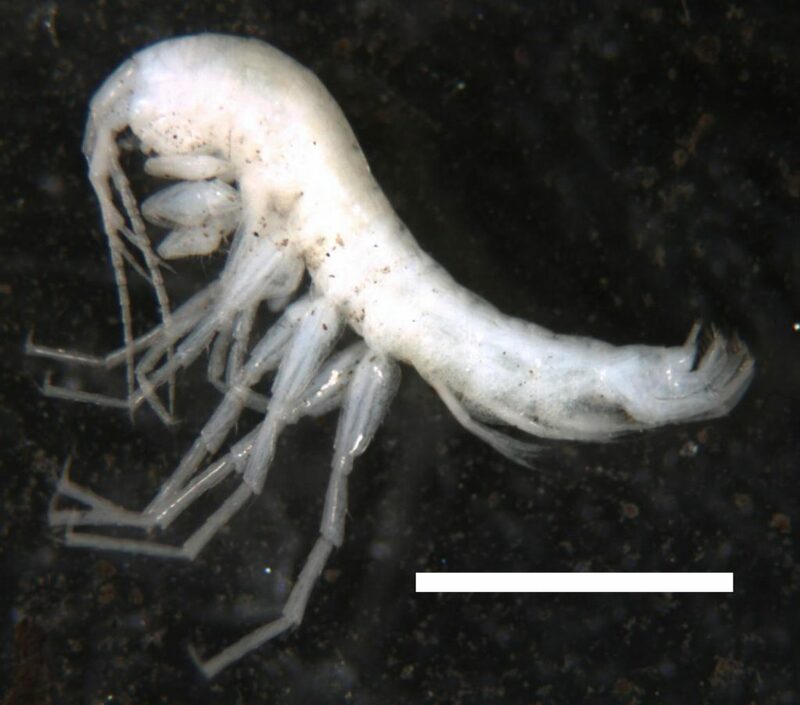 This is Stygobromus albapinus Taylor & Holsinger 2011, a groundwater amphipod (family Crangonyctidae) discovered in a cave in Nevada. Scale bar is 2 mm. 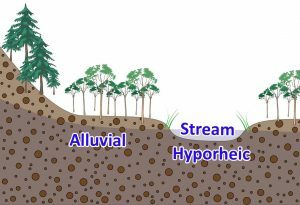 Alluvial aquifers and the hyporheic zone comprise two closely related types of groundwater associated with surface streams & rivers. Many of the Stygobromus species in Colorado are known primarily from the hyporheic zone – the ecotone between stream water and groundwater flowing underground beneath streams. 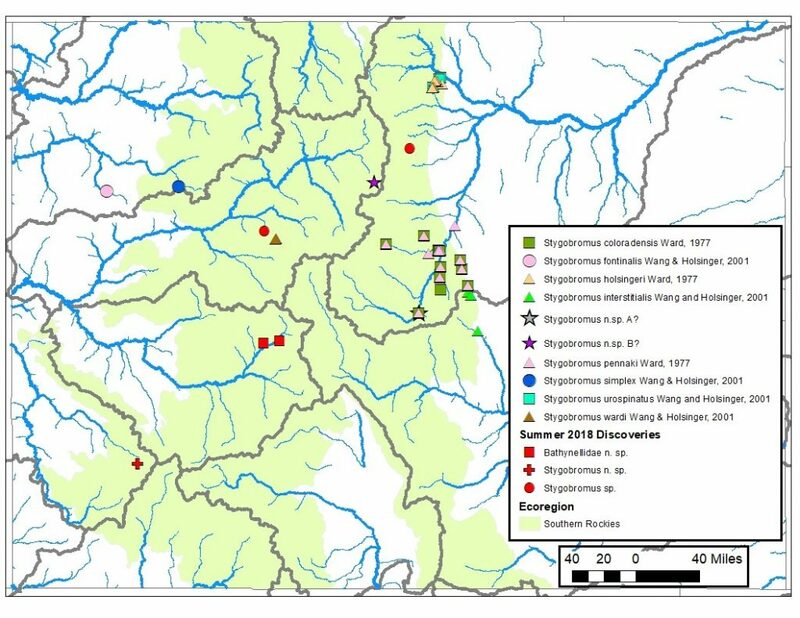 Stygobromus amphipods likely also occur in the alluvial aquifers of the waterway floodplains adjacent to the stream and rivers in the state. Distribution of groundwater amphipods in Colorado after summer 2018 sampling. Additionally locations for a new species of Bathynellidae (Bathynellacea) are shown. New (2018) discoveries are in red. 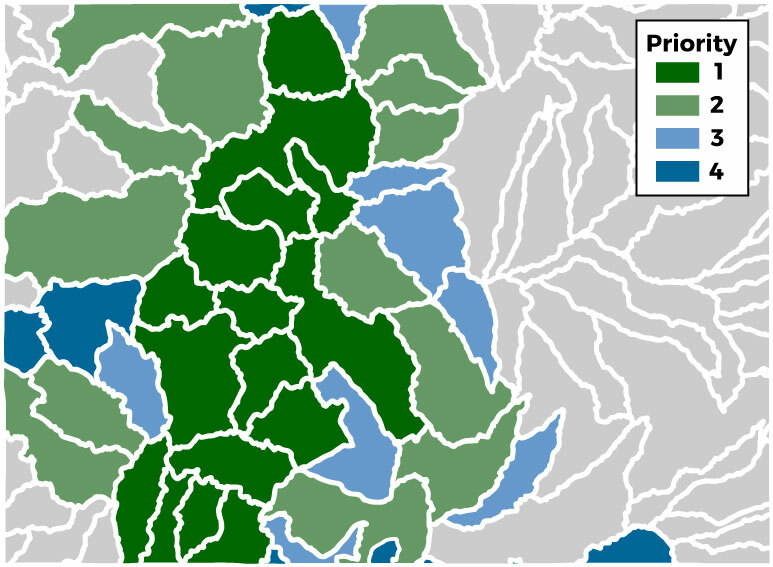 The green shading indicates the extent of the Southern Rocky Mountains ecoregion in Colorado, gray boundaries correspond to major watersheds as defined by the US EPA. 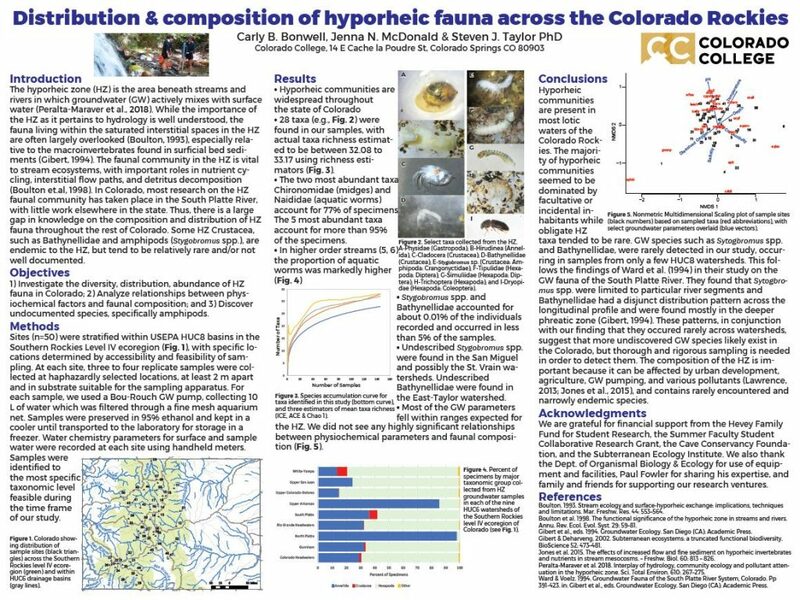 In summer 2018, CC students Carly Bonwell and Jenna McDonald worked with me to sample for amphipods across the Colorado Rockies. We focused especially on the hyporheic zone of streams, but also have looked at alluvial aquifers, springs, and an occasional cave stream. We are partitioning our efforts among smaller drainage basins, conveniently designated by the US EPA as HUC8 watersheds, prioritizing watersheds that lie within the Southern Rocky Mountains ecoregion in Colorado, and emphasizing areas that previously have not been well sampled. Preliminary findings have been presented at a poster this fall at the Summer Student Collaborative Research (SCoRe) Symposium, and you can look at Carly and Jenna’s poster, below, by clicking on the image to enlarge it. The very large full-sized version can be downloaded as well. Colorado HUC 8 US Environmental Protection Agency watersheds, with priority for groundwater sampling indicated by shading. Various sampling techniques are being utilized, including use of a Bou Rouch groundwater pump (basically and old farm-style well pump head attached to a short pipe which has been pounded into stream gravels), a vacuum pump, a shovel and drift net for sampling subsurface stream gravels, and, in springs and caves, hand collecting with a small dip net and baster. 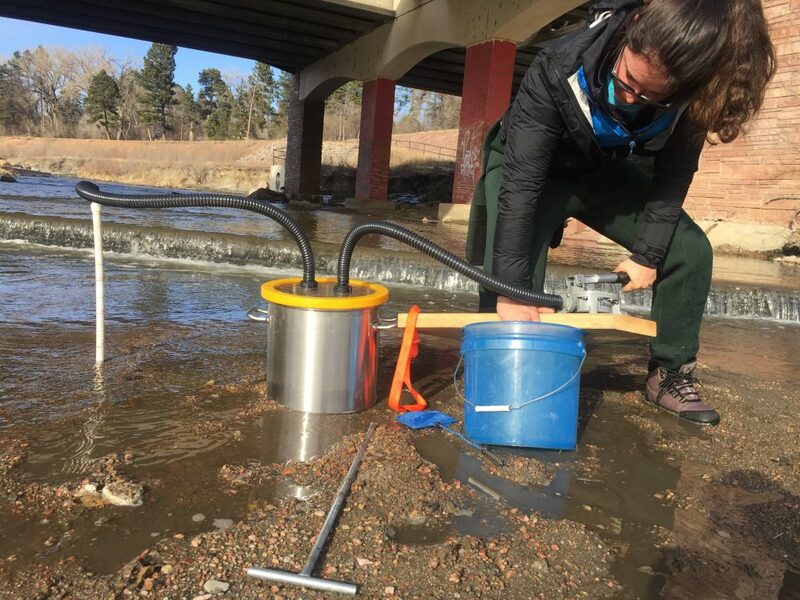 CC undergraduate Carly Bonwell using a vacuum pump to look for hyporheic amphipods beneath Monument Creek where it passes through the Colorado College campus.. Here is a short video of vacuum pumping in action, in the upstream reaches of Monument Creek in Palmer Lake, Colorado. 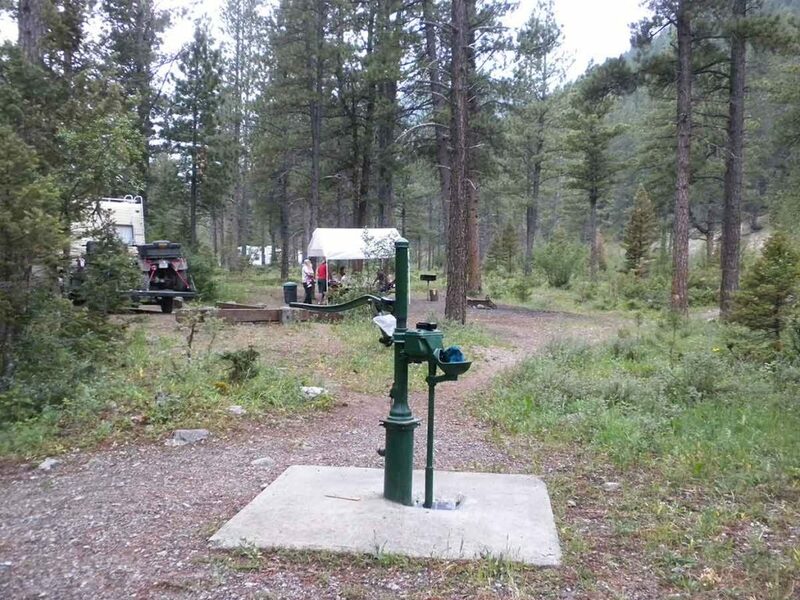 Forest Service campgrounds occasionally have shallow groundwater wells which may provide easy access to alluvial aquifers, such as this well in Montana. Image courtesy of V. Bowden. 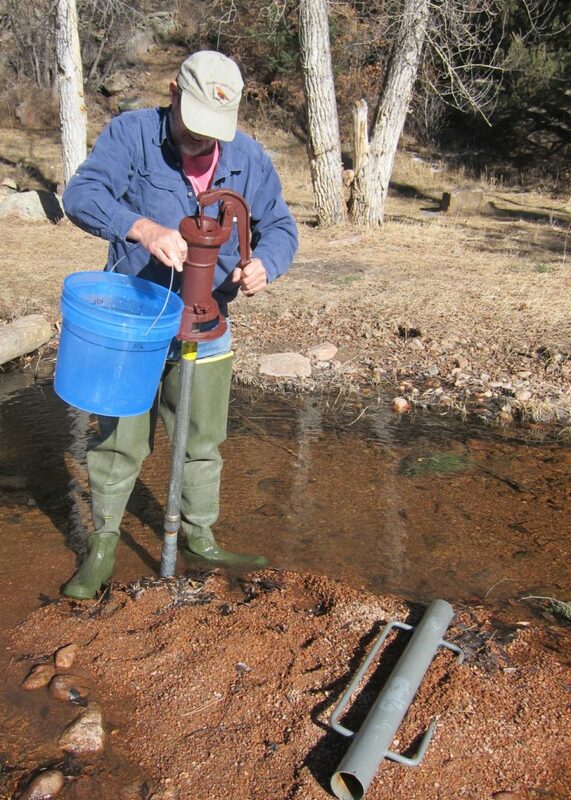 Bou-Rouch Pump set up in Eightmile Creek, Freemont County, Colorado. Fence post driver in foreground was used to drive the well point into the substrate for sampling. Black line on the bucket indicates a 10 liter sample, allowing us to somewhat quantify samples. Photo by JoAnn Jacoby. 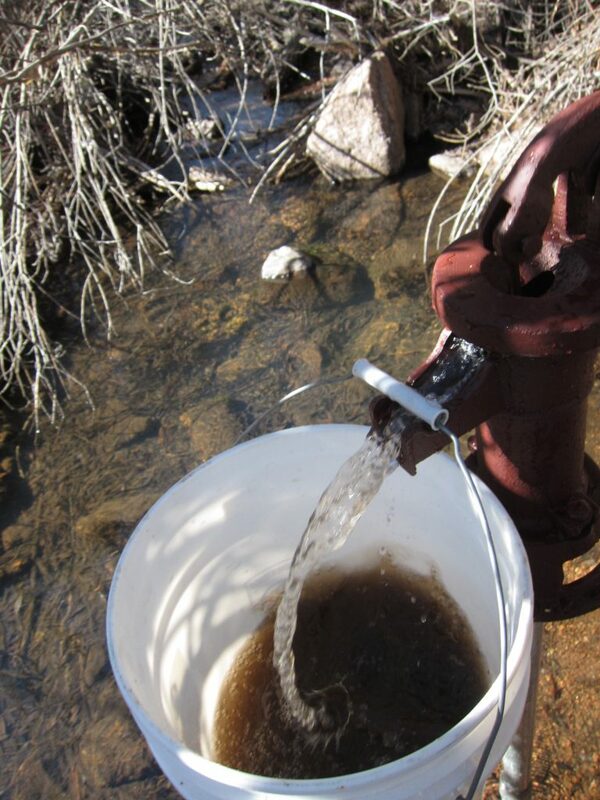 A Bou-Rouch Pump being used to pump up shallow groundwater from Monument Creek in Palmer Lake, Colorado. A stream drift net in Fountain Creek, (El Paso County, Colorado). Digging deep into substrates with a shovel, and gently scattering the deepest gravels in front of the net can be a great way to collect hyporheic amphipods. Hand collecting at springheads and in caves with a fine-mesh dipnet and baster can sometimes recover groundwater amphipods. 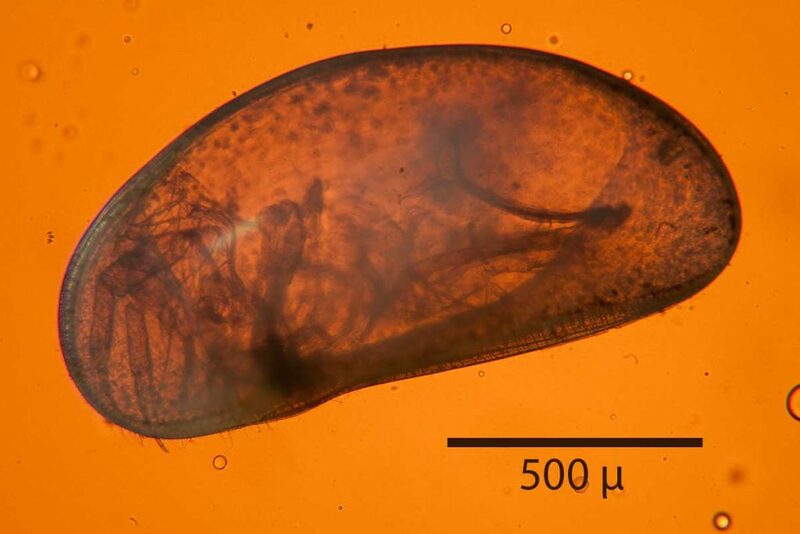 Sampling the hyporheic zone yields an entire community of organisms adapted to this environment, such as the groundwater ostracod (Crustacea) and larval midge (Diptera) shown below. 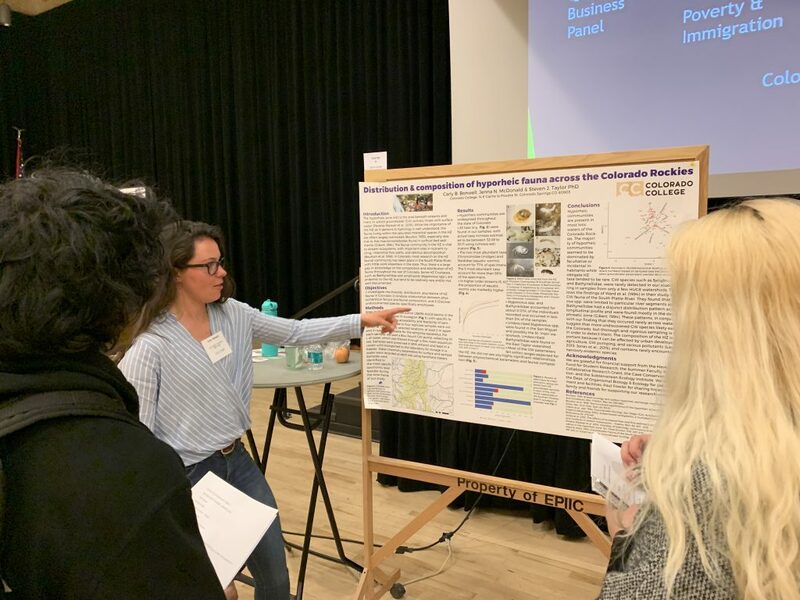 Working with CC students Jenna McDonald and Carly Bonwell, we’ve started to get a good picture of the community of macroinvertebrates living in the hyporheic zone in streams and rivers of the Colorado Rockies. If you have an interest in invertebrates living in streams, or below streams, feel free to contact me about research possibilities. 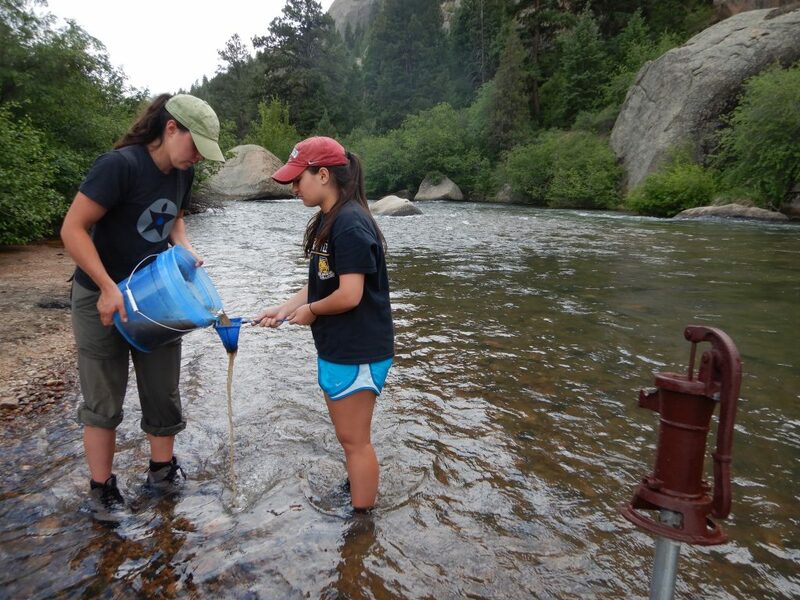 But, if you are more interested in carbon and nitrogen cycling, and human disturbance impacts on these ecosystems, check out the awesome work being done by Dr. Becca Barnes & the students working in her lab. A freshwater Ostracod (Arthropoda: Crustacea) collected from hyporheic water beneath Spring Creek. 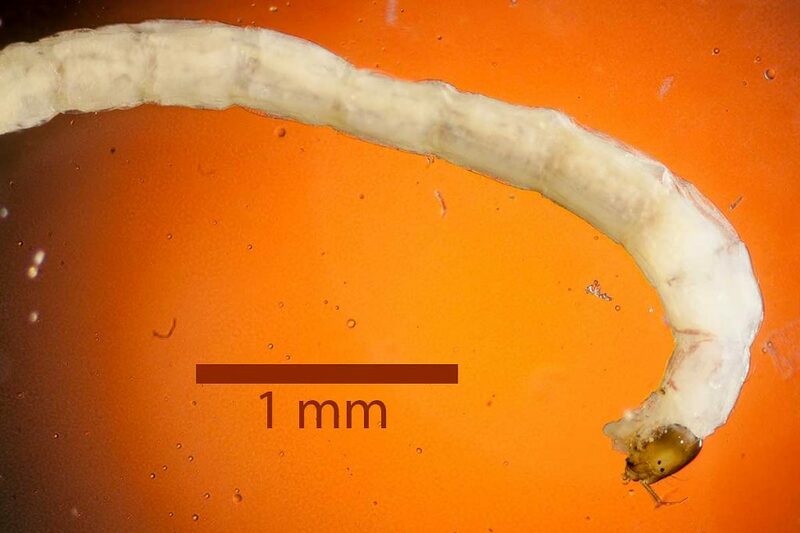 This individual, an adult, is about 1 mm long. This tiny fly larva is an immature state of a midge (Insecta: Diptera: Chironomidae). Collected from the hyporheic zone of Spring Creek, near Gunnison, Colorado.